Making people laugh is big business. With huge Netflix specials, global stand-up tours, television shows built around comedic personalities, and special radio channels dedicated to the art of comedy, there are plenty of comedians out there enjoying massive celebrity status. And while professional funny people make it their mission to bring humor to the forefront, we’ve also spotted some very serious watches on their wrists. 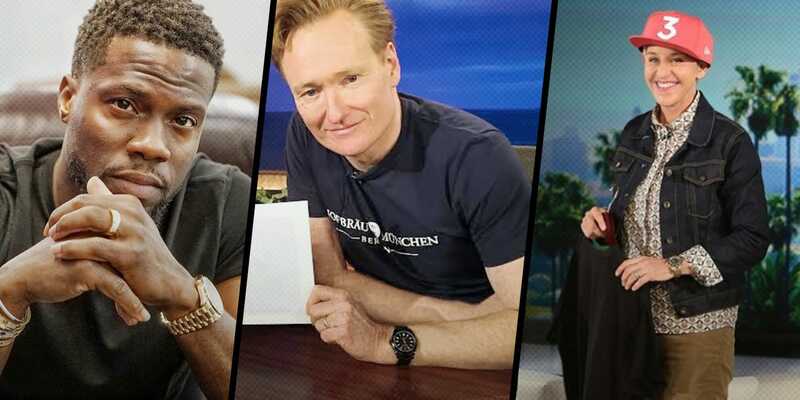 Join us and we take a closer look at some superstar comedians and the Rolex watches they love. Rolex fans will probably recognize stand-up comedian, actor, and writer Aziz Ansari as a fellow watch enthusiast since he’s appeared on both Hodinkee and GQ videos discussing his appreciation of Rolex watches. Aziz often wears a vintage 1980s Rolex Day-Date President in yellow gold with a black onyx dial and black yellow strap. He treated himself to that special Rolex watch when he had his first stand-up show at Madison Square Garden in New York City. He even gave his parents and brother matching Rolex watches with the same black onyx dials! Aside from his Day-Date, Aziz also has other super cool vintage Rolex watches including an Explorer ref. 1016 and the Rolex chronograph ref. 6234. A mainstay on television since the early 1990s when he took over David Letterman’s gig as the host of Late Night, today, the hilarious Conan O’Brien hosts his Conan show on TBS. Ready for the election to be over? Well you can vote early in most states. Go to @HeadCountOrg and click the link on top to see if you can #GoVote now! Among his many luxury watches, we’ve spotted Conan wearing the antimagnetic Rolex Milgauss watch, characterized by the iconic orange lightning bolt seconds hand. According to Rolling Stone magazine, this custom all-black Milgauss was in fact a gift from Conan’s wife on his 50th birthday. The black dial of his Milgauss even has orange “Team Coco” text on it in reference to his famous nickname. Another Rolex watch we see Conan wearing frequently is a vintage steel Rolex Submariner with a black bezel. But rather than on the customary steel Oyster bracelet, he chooses to wear his on a leather fatstrap. Frankly, it’s hard to keep up with actor and comedian Kevin Hart’s Rolex collection because he simply has so many! A quick scroll through his Instagram feed and you’ll see that he pretty much always has a fantastic luxury watch on his wrist. Some of our favorite Rolex watches owned by Kevin include the yellow gold anniversary GMT-Master II with the green dial, a GMT Master II with black sapphire and diamond set bezel, a platinum Day-Date, a yellow gold Day-Date, the new steel Daytona with the black ceramic bezel, and a white gold Sky-Dweller with a black leather strap. What’s more, Kevin even has a Rolex Cellini Moonphase watch in Everose gold—a current model you don’t see out in the wild that often. The Philly native has one of the coolest modern Rolex watch collections we’ve seen from a celebrity. Actress, comedian, writer, and now host of her own Emmy-winning daytime show, Ellen DeGeneres is also a serious luxury watch collector. For a watch geek, half of the fun of watching her television show is figuring out what glorious timepiece she has on that day. Unsurprisingly, Rolex watches often make an appearance—and she has a ton of them! Judging by her watch choices, it’s safe to say that the Rolex Daytona is Ellen’s favorite. A few of her Daytona watches include the anniversary platinum Daytona with the brown ceramic bezel, a yellow gold Daytona with the black Oysterflex bracelet, the steel Daytona with the black ceramic bezel, and at least two Everose gold Daytona models. Ellen also sports vintage Daytona watches and we’ve seen both steel and gold models. Aside from her Daytona chronographs, we’ve also seen Ellen wearing the yellow gold anniversary GMT-Master II with the green dial, a vintage GMT-Master with the ultra-rare blueberry bezel, the white gold Submariner with the blue dial and bezel, the Everose Yacht-Master 40 with the black Oysterflex bracelet, a yellow gold Day-Date 40, and a platinum Day-Date 40. An epic watch game from one of the nicest celebrities in the spotlight today! So, the next time you catch these comedic celebs on TV, in a magazine, or live on stage, check to see what watch they have on their wrist. The chances are it’ll be a Rolex watch.